All of the products at The Maine Bucket Company can serve a variety of purposes. From different wholesale wood display needs to actual resale products in your retail inventory, we can assist whatever your business needs. The items listed in this section are not different, except they are built with specific functionality in mind. We offer three sizes of pet food storage containers. 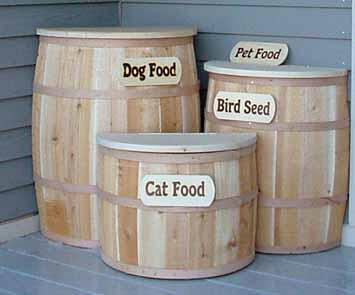 These wooden containers can hold many different items and the sign options show the versatility of these half barrels. For each half barrel, you purchase you may receive one sign with any of these distinctions: Dog Food, Cat Food, Pet Food, Bird Seed, Recycling, Trash, or a blank sign. 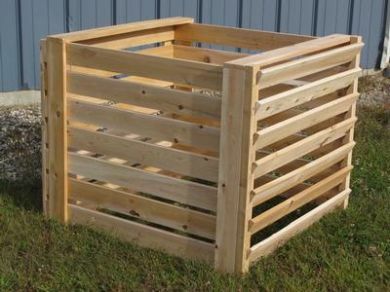 We offer a handcrafted compost bin that would make a perfect addition to any garden center’s resale inventory. Its construction is of Northern White Cedar and has the potential for a long life depending on how it is maintained. 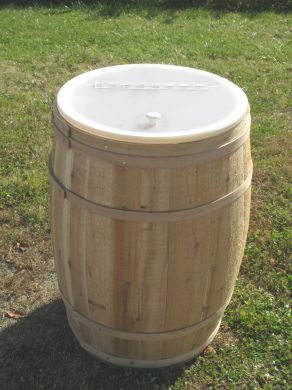 We offer one barrel that includes a food grade liner and, for an additional price, can be purchased with an acrylic flip lid, scoop, and holder. The food-grade liner sits a foot into the barrel and can be used for any manner of perishable items.